One of the ultimate challenges with guest blogging is the time it takes just to get one article published on one guest host. There are guest blogging websites that will connect guest bloggers with guest blog hosts. In fact, this is the traditional way that one can post a guest blog on a host website. But, have you ever tried to do this? 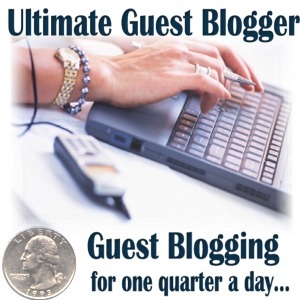 Traditional Guest Blogging: Worth the Time For One Link? Let’s take a look at the general procedure. First, you have to find hosts that are of a similar topic to yours. Why do you want the guest host to be of a similar topic? Well, as most of you know–especially those who have learned how to get top search engine results–you get more value from an inbound link that is on the same subject as the site or page that you are promoting. In addition, guest hosts that are of a similar subject will be more likely to consider the content that you might submit. So, after you have found sites that match your topic and determined whether they will accept guest posts, you then must ask yourself: Is this site worthy of the time and effort that I will put in to submit my article? We all know that not all sites are created equal and a link from one site is not the same as a link from another. Your next step is to contact the authors of each of the guest hosts that you have identified as a place that you may like to submit your content. Though they accept guest posts, they may or may not accept yours. It should also be known that your article must be unique. You cannot have the exact same article published on several guest hosts. If they find out, they will no longer accept your content. After all this time, discovering and contacting many guest hosts, you may have already killed several days and not achieved even one inbound link. This is just unacceptable. Your time is too valuable and the return on your investment too little. This is why we created Ultimate Guest Blogger–to overcome all of these hassles. We established hundreds of accounts on the world’s most prominent blogs. These are all public blogs with very high root PR, which virtually guarantees that your links will be picked up by the search engines promptly. In addition, there is an implicit trust of your articles because they are on sites that the search engines deem very important. Using advanced technologies, we allow you to publish to all of these accounts through just your one account established with Ultimate Guest Blogger. Thus, in order to guest blog on prominent Internet blogs, you simply need to sign up for Ultimate Guest Blogger and you are ready to go without delay. With one account, you can begin publishing immediately. Many have said it’s too good to be true. 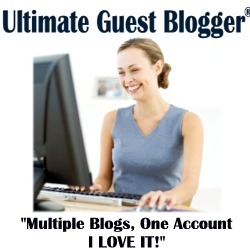 We just like to say, it’s Ultimate Guest Blogging!